At the Area Committee Meeting of 12th March 2014 Cllr Candler, then Chair of the Area Committee, gave an undertaking that there would be a progress report on the proposed foodstore development on Chadwick Street at every Area Committee Meeting. The undertaking followed pressure from many quarters including the Civic Society who felt that the council's sacking of Kirkland as the preferred developer for Chadwick Street would lead to delay if not abandonment of the project. Our worst fears seem to be coming to pass. Rumours abound but hard information from the council is difficult to obtain. Is it too much to ask that our elected representatives level with us and let us know what is happening? 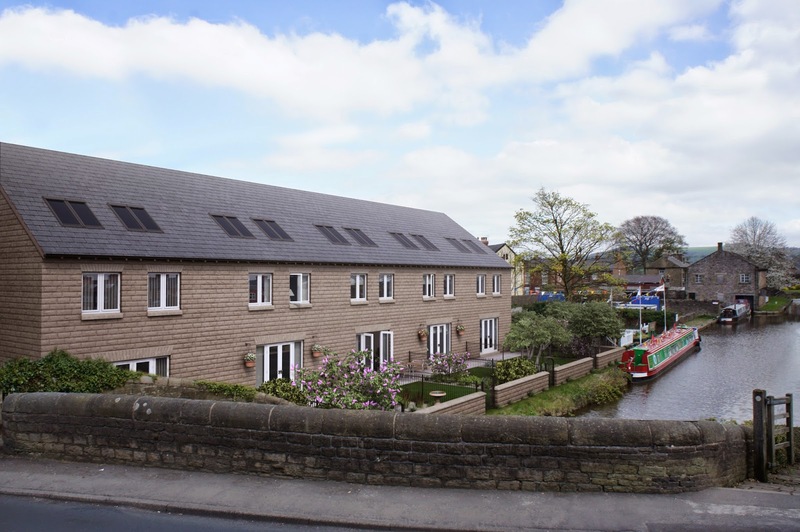 The other matter of note is that a planning application for the garage site at the Church Lane end of Marple Wharf came up for consideration. A planning consent was given in 2004 for three houses. The developer now feels that he needs to build five houses to make the project viable and has sbmitted a planning application to change the design to the anonymous block of five houses pictured below. could not make a decision on! The Civic Society strongly opposed the application on the grounds of overdevelopment (amongst others). Sadly, only Cllr Ingham was prepared to refuse the application. Cllrs Alexander, Candler and Abell voted to send the application to the SMBC Planning and Highways Committee without a recommendation. This means that a group of Stockport councillors with little knowledge of Marple or its heritage will make a decision on the development of this important site without any guidance from our local councillors. Cllr Bispham could not speak due to a conflict of interest and Cllr Dowling is committee chairman and made no comment.